Washington, D.C. — A few months ago we sent a birthday card to an old friend. At the time, I was experimenting with cursive capital forms and their interlocking layout. The quote from Arthur Conan Doyle's The Sign of Four — "I am the last and highest court of appeal in detection." — seemed very appropriate for our friend, an appellate attorney and huge fan of Sherlock Holmes. To add a "meta" layer of fun to the card, I used this quite indecipherable script for the lettering. Upon receipt of the card, our friend sent us these very charming videos of his daughters trying to read the quote. The script's very real illegibility, duly noted. Washington, D.C. — I've been diversifying my envelope colors and working a lot more with envelope patterns and illustrations. Seeing them together in batches makes for a cool effect. Washington, D.C. — I've been sending my daily letters out in batches of three or four. I decided to take photos of each batch just to see where I am color-wise with my envelope choices. I guess I'm in a mostly blue phase right now. I love using Dr. Ph. Martin's Bleed Proof White ink on blue envelopes. It really makes the blue pop. The Raleigh batch: I think this blue envelope to my brother started this whole blue period. A very spring color batch. Will turn my attention to pinks and purples. Little Dragon video for Twice - A shadow puppet theater featuring a little girl, a big bird, and a skeleton. Directed by Johannes Nyholm. Washington, D.C. — It's funny how often you forget to watch music videos, even though they enhance your appreciation of a song. I listen to the Swedish band Little Dragon a lot on Spotify while I work, but I never think to watch their videos. Recently, I recommended the band to someone and in looking up their song Twice, I stumbled upon this amazing video. As a child, I always loved shadow puppets and silhouettes, so to see this haunting song transformed into a lyrical piece of puppet theatre was wonderful. It's such a beautiful and melancholic film full of subtle details. A recent pen pal letter with a silhouette design on the envelope. I really like Kara Walker's silhouette art, so I created this envelope using a similar technique. The illustration was drawn and filled in with black sumi ink, so there was a nice sheen on the black surfaces of the envelope when held up to the light. It's a different sort of shadow puppet play depicting a childhood scene of the lazy days of summer. Washington, D.C. — Lately I've been having a difficult time getting myself over to the post office to post my "A Letter a Day" letters, even though it's a mere 7-minute walk away. It must be the lingering winter, the snow, the grey skies that encourage this laziness. I must say, though, one benefit of hoarding my letters is that I get to see the spectrum of colors in the letters I produce for the week. It's not an intentional thing, but somehow my mind subliminally chooses envelope and paper colors that complement one another. In this particular case, I chose colors that are very "springy". I must be really over the winter. After the snow we got yesterday, who wouldn't be. Washington, D.C. — It's already March (!) and I'm over the 25% marker with my "A Letter A Day" project, a commitment of writing personal letters to family, friends, and Flourish Forum pen pals until the end of 2015. I'm really terrible at keeping resolutions or long-term personal goals, so this has been quite an accomplishment. Truthfully, I have never been so focused on anything like this before, so I'm excited to keep pushing forward, even if it means less leisure time, less sleep, less whatever it was I was doing before this. In looking back at my previous letters, I thought it would be fun to post my favorite 5 of 2014. In writing letters, I try to "represent" the person that I'm writing to—in other words, do my best to capture his or her character, personality, or interests. It was difficult to choose 5 because each letter reminds me of something special about the people I write to, and I am truly grateful to have that opportunity to share my words with all the wonderful people around me. October 31, 2014 — My sister is a horror-film aficionado, and we both love watching scary movies whenever we are at our parents' house. One of our all-time favorites is Stanley Kubrick's The Shining. It was fitting to send her Halloween greetings with the iconic twins on the cover, and Jack Torrance's axe on the envelope. November 8, 2014 — A few years back, I became friends with a lovely architect over our shared interest in mid-century design and architecture. In writing her initials, I immediately thought of the historical Knoll logo and typeface. Not only was it fun to draw out her initials in a Knoll-style, but also to play with the translucence of the vellum envelope. The "KW" is actually on the front of the card, while her address is on the envelope. Star-crossed lovers meeting for the first time: an idea that came to me in a dream. November 11, 2014 — Nicole is one of the first pen pals from the Flourish Forum that I started doing letter exchanges. This was my first letter to Nicole, and for some reason, I woke up with this image in my head of a moonlight tryst between two people. I love the idea of treating the envelope as a film still, a story captured in one moment. The details are there, but the viewer has to fill in the gaps and figure out what that story is. November 21, 2014 — The great thing about this project is that it makes me aware of the people that I have lost touch with, and how I can reverse that by reaching out through letters. Instead of texting a happy birthday to my friend, I thought it would be more special to send a birthday letter with a scene from our favorite film, Kiki's Delivery Service, on the envelope. I love the single accent of red in the illustration. December 3, 2014 — I love looking at patterns and textures in everyday objects. I had recently visited the Freer/Sackler and in their gift shop, there was a kimono with a pattern of undulating white waves against a mauve-ish background. When I started to address this envelope, I immediately thought of the kimono pattern but translated into gold ink on black. This has since become one of my favorite patterns and motifs to do on dark envelopes. Letter written on pale pink parchment in the Copperplate style. Letter written on creme parchment in a freehand calligraphy style. Washington, D.C. — I love discovering graphic patterns in everyday objects. In the midst of photographing one of my daily letters, I was surprised to see how beautifully the double-sided writing melded into one another when held up to the light. The result is a chaotic but elegant mashup of letter forms. Sometimes, as in the case of the copperplate lettering, there's a serendipitous symmetry in the letters reflected from the back side. It is the little, simple—and unexpected—things in life that give us pleasure. A special thanks to my pen friend Star Lively, whose beautiful and fluid calligraphy inspired me to loosen my grip and go freehand. The first page of my log, neatly handwritten. The second and third pages of my log, slowly becoming a mess. Washington, D.C. — I have reached the 100th letter in A Letter A Day. This art project to write a letter every day not only serves as valuable calligraphy practice but also as a creative wellspring for my illustration work. I make sure that each letter I write—both in form and content—is unique and tailored specifically for the person receiving it. You can view the project thus far on my Instagram. More importantly, this project enables me to get back in touch with long lost friends and family. I appreciate this opportunity to reconnect with people I care about. But what I appreciate more is to hear back from them with news that they are healthy and happy. 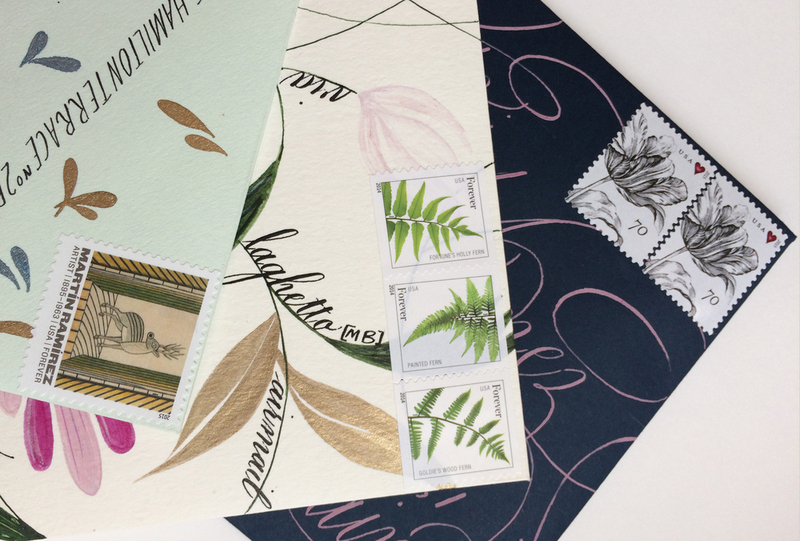 Letter writing gives us the chance to have deeper connections with the people around us. It is an irreplaceable art and tradition worth keeping alive. Rio Grande, Puerto Rico — Back in October when I started studying calligraphy more seriously, I looked to letter writing as my primary means of practice. 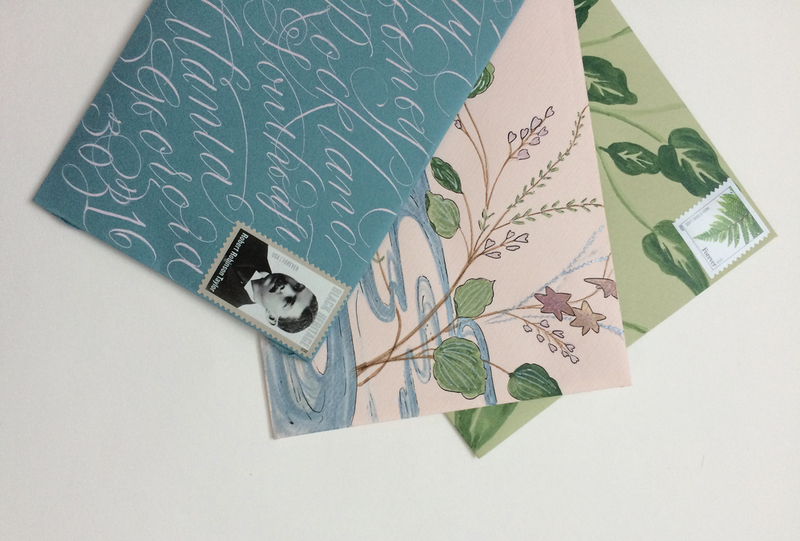 My practice evolved into writing "a letter a day" to family, friends, and Flourish Forum pen pals. As the New Year approached and I started thinking of how I always fail at keeping resolutions, I thought to myself why not make "a letter a day" this year's resolution. I vowed to see this project through until the end of 2015, a total of 432 letters. While in Puerto Rico over the holiday, I diligently wrote letters and postcards with my travel kit of calligraphy supplies.